Family Reunion Planning Guides Apps and Books: Gotta Love It! South Carolina, Maryland and Virginia! "I love this application!" That's what users are saying about Fimark's Family Reunion Planner. Remember that the planner also comes with a family reunion planning book that ships out as soon as you get the immediate download. 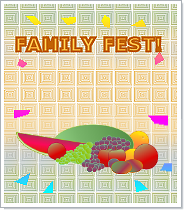 And don't forget to check out the spectacular family reunion themes included! In case some of you did not know we made major changes to how you plan your family reunion event. Now our online family reunion planning interface begins with selecting your theme. That feature was introduced back in 2010 with Fimark's Family Reunion Planner upgrade. Think that was exciting? Now the spectacular family reunion theme planning package is better than ever! After we partnered with zazzle.com we put together a themed based package that allows reunion planners to select event wear and correspondence by theme. The beauty of this is now you don't have to stress over how to conceptualize a theme idea, related activities and dinner program that is inspiring, motivating and above all mutually understood by all in the event group. It's all there for the taking. Just review, edit and your done! 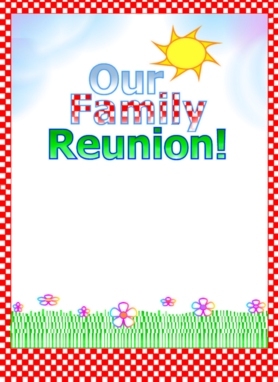 In the Family Reunion Planner there is an application along with worksheets for each family reunion theme. Now each theme comes with it's own official theme logo. Included in the package is a correspondence package consisting of matching flyers, greeting cards and invitations. But that's not all! There is now an ensemble of matching three piece reunion event wear including T-shirt, cap and apron. Best of all each attendee can order their own reunion event wear once they have received an invitation and url or link to the order web page. Timeline Checklist". You should have collected photos, stories, genealogy research and have started on your photo and genealogy presentations. These will go in family reunion keepsake booklet. Your T-shirts order should be submitted and in process. If not, order them today! No more time to delay. When the shirts arrive you'll need to check each one and return a few for replacement. Plan to have your t-shirts on hand by the end of April or early May. Haven't settled on a vendor yet? Get bulk discounts on t-shirts at http://www.zazzle.com/zzibcnet* and save up to 57%. Committee members should have their department assignments and task worksheets found in Fimark's Family Reunion Planner (Workbooks sections). Make sure they are making progress on assigned tasks. Some attendees will simply not get the t-shirt fee payments in on time. Once you have ordered the t-shirts and received the bulk discounts others may still want to order more. Just email them with the reunion event theme and this link(unaltered) http://www.zazzle.com/zzibcnet* No more worries. April is crunch time! Don't put off in an hour what you can do this minute. That's right if it's on your mind and you have a few minutes to spare first write down your task, then have at it. It's also money saving time. Lot's of event planners are making pit stops at Dollars Stores. Yes Dollar Stores to find materials and creative ideas for decor, games and party favors. But if you really want to save shop at Online Stores like Amazon.com Brenda and I bought our next generation phones from Verizon. We were excited when they were delivered early in the week. We went to the local Verizon store for setup service. While there we looked over the accessories but found the prices rather steep so we went online to my favorite shopping place Amazon.com. We found the same accessories for half the list price and were able to get other items with the money we saved. In addition if you buy over $25 in qualified merchandise you get free shipping. Needless to say is was a great money-saving shopping day. Mobile devices can help you save hours carrying out event planning, organizing and management tasks. Invest in a next generation mobile device such as an ipad, android tablet or one of the larger phones.